Citizen science program focuses on fall activity. When the rallying call of “Save the pollinators!” sounded last fall, Texans responded. For 10 days, they reported monarch sightings and planted native gardens. They took nature walks and learned about milkweeds. They uploaded photos of butterflies, moths, bees, beetles and hummingbirds to social media and monitored insect activity in yards and natural areas. All told, thousands of adults and kids participated in the first-ever Texas Pollinator BioBlitz, led last Oct. 7-16 by the Texas Parks and Wildlife Department. The statewide effort sought to raise public awareness about monarchs and other pollinators, get people outside and encourage them to plant nectar-producing natives. This year’s BioBlitz is Sept. 23-Oct. 8. The idea for the BioBlitz came from brainstorming sessions with partnering agencies that support the Texas Monarch and Native Pollinator Conservation Plan, a 41-page document that outlines TPWD’s long-range strategy for reversing the decline of eastern migrating monarchs. Ultimately, the group agreed. They’d stage a statewide social media bioblitz. Technically, a “bioblitz” is a set period of time when volunteers work together to survey and identify as many species of living organisms as they can within a designated area. The term was first coined in May 1996 by a group of biologists and naturalists who came up with the economical concept for inventorying species at Kenilworth Aquatic Gardens, then an oft-ignored park in Washington, D.C. The Texas BioBlitz, however, involved more than tracking species. Individually or in teams, Texans participated in many ways, both easy and advanced. For instance, they simply posted images to Instagram and Facebook, using the hashtag #savethepollinators. Daily challenges asked observers to share photos and videos of pollinators on native plants, pollinators in action and peculiar-looking pollinators. On the other hand, more experienced naturalists uploaded observations to iNaturalist. Meanwhile, numerous parks and organizations hosted their own BioBlitz activities. At Galveston Island State Park, staff streamed a live video on Facebook that took viewers pollinator hunting in the bayside park. Near Sherman, Texas Master Naturalists tagged monarchs at Hagerman National Wildlife Refuge. At Lanier High School in Austin, students planted native milkweeds gifted by Monarch Heroes, an initiative led by the National Wildlife Federation to create monarch habitat in urban areas. At Austin’s Lady Bird Johnson Wildflower Center, programs held during the BioBlitz taught visitors how to use iNaturalist. They also helped entomologists to identify moths and other insects during after-dark hikes. 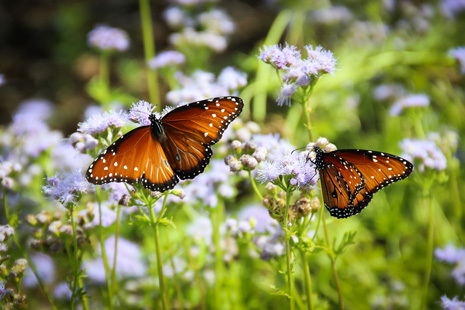 In Mission, the National Butterfly Center hosted gardening workshops and butterfly walks. In Houston, several agencies jointly hosted a one-day bioblitz at several city parks. Shelly Plante, TPWD’s nature tourism manager, administered the BioBlitz’s iNaturalist project, which netted more than 2,290 observations and 440 species. Likewise, Curtis Ackermann, an associate biology professor at Austin Community College, ranked first among 186 registrants on iNaturalist with 274 observations and 95 species that he posted during the 10 days. Amazing, indeed. That’s exactly what BioBlitz partners hope Texans experienced — a deeper appreciation for our natural world. Hey, did that flower just move? I lean in closer. A second later, the flower–no bigger than my littlest fingernail — wiggles. I squint harder. The flower wiggles again. However, the flower’s not a flower but a CATERPILLAR less than half an inch long! A caterpillar with a body that mimics a specific flower? Fascinated, I peer closer. Ah-HA! Somehow, the green caterpillar adhered bits of blue flowers and dried petals to itself. Amazed, I shoot more pictures. Which species of moth or butterfly larva behaves like this? “Sheryl, supper’s ready! You done yet?” My husband, James, calls from the back door of our home. “Just one more,” I wheedle. “Please?” James rolls his eyes and goes back inside. I confess. I’m obsessed, thanks to an email I received. “With hummingbird and butterfly migration well underway,” the news release announced, “it’s the perfect time to record what you’re seeing all around Texas. Participate in the first ever statewide Texas Pollinator BioBlitz October 7-16!” Intrigued, I linked to the BioBlitz website and registered. Opening weekend, I snapped photos around our yard, which is a certified Texas Wildscape that’s planted primarily with natives. On my computer, I posted my observations of butterflies and moths on iNaturalist.org, an online network of naturalists and biologists who record and map findings of biodiversity worldwide. Observations are logged on the website or from the iNaturalist mobile app. A single observation may include multiple photos or just one. After uploading my images to iNaturalist, I input the GPS location of each observation and noted identifications as best I could. Presto, I nailed down the bee to its taxonomic name of Apis mellifera. ButI needed help with the rest. That’s when other iNaturalist observers — many of whom are experts in their field — lend a hand. As a community, they review submitted observations of organisms that range from lichens to lions. They suggest identifications, talk back and forth via comments and, if possible, confirm IDs to genus and/or species. Soon my BioBlitz species list included a Hawaiian beet webworm moth, spotted beet webworm moth and eastern carpenter bee. For the next few days, I photographed more pollinators. On a flame acanthus, I shot pictures of a dime-sized, black-winged insect with a skinny orange-and-black abdomen. On the mistflowers, the flash on my camera stilled a nectaring gray moth that beat its wings like a hummingbird. What had I found? I also photographed familiar species, like a large milkweed bug on an antelope horn. At my desk, I researched online to identify what I’d photographed. The skinny-waisted insect was a hover fly. The moth ID would remain unsolved until weeks later. To my surprise, my additions on iNaturalist knocked me into the “top five” among BioBlitz registrants for both observations and species. Mysteries to solve and competition to boot? I was hooked! “Whatever!” I sassed back. Like a big-game hunter on a jungle safari, I lurked by the flowering boneset and salvias in our front yard. I surveyed the straggler’s daisy in our backyard. I peered at grass blades in “the Meadow,” our adjoining “vacant lot” where we encourage indigenous plants to grow. Throughout the week, I photographed butterflies and moths along with a plant bug, a large milkweed bug and a mini walking stick that lived on our screen door. Later I learned that my walking stick was actually a thread-legged bug. In the front yard, I bee-lined to the white mistflower. Among the white blooms was a bluish-black butterfly with iridescent gold and blue spots on its tailed hindwings. You’d have thought I won the lottery when I recorded my first observation of a great purple hairstreak. I kept hunting. My observations included a pipevine swallowtail. Sleepy orange. Gulf fritillary caterpillar. Eufala skipper. Hypocala moth. I continued to comb our native gardens…. Until that nearly invisible caterpillar caught my eye. So here I am, still transfixed on the mistflower. But I can’t waste time. Back to hunting! After dark, I snag images of more moths. Exhausted, I end the day still among the top five BioBlitz observers! Oh, that flower-covered caterpillar? It was a camouflaged looper, the larvae of wavy-lined emerald moths. These caterpillars cut bits of plant and flower tissue from whatever they’re feeding on and tie them onto their spiny backs using silk secreted from special glands. They even refresh their wilting attire and spin pieces into their cocoons. Yahoo, another mystery solved! Now excuse me while I get to work on the next one…. Imagine your next breakfast without coffee or juice. That dismal scenario could come true if we don’t protect and preserve pollinators. By definition, a pollinator is an insect or animal that transfers pollen from plant to plant. 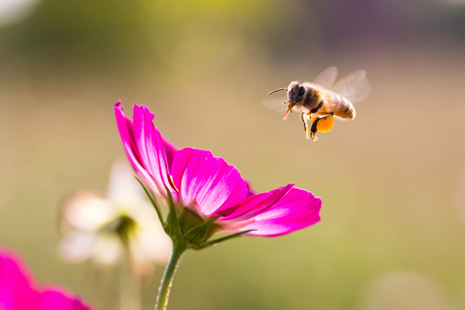 Kinds of pollinators include bees (honey bees, solitary bees and bumblebees), moths, butterflies, ants, wasps, flies, beetles, hummingbirds and bats. Flowers successfully fertilized by pollinators produce seeds (coffee beans) and fruit (oranges). Nearly 80 percent of all plant species are pollinated, mostly by insects. What’s more, three-quarters of the world’s most common food crops­ — including coffee, tea, berries, fruit and nut trees, and vegetables­ — require insect pollination. Worldwide, pollinators continue to decline due to habitat loss, invasive species, diseases and pollution. That’s why it’s important that we do all we can to save pollinators! Plant native flowering species found in your area. Place shallow dishes of water in sunny areas or create a muddy spot to provide a water source. 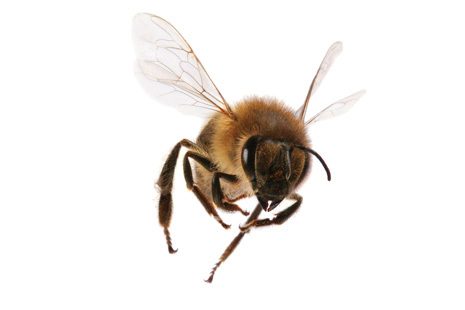 Provide bee boxes, undisturbed soil areas, and piles of woody debris for shelter and overwintering habitat. Use compost instead of commercial fertilizers.